Space shuttle Discovery arrives at Launch Pad 39A on Jan. 14, 2008 for a planned Feb. 12 liftoff on STS-119. Thisstory was updated at 10:20 p.m. EST. NASA hasdelayed the planned Feb. 12 launch of the space shuttle Discovery by at least aweek to allow extra time to evaluate vital fuel valves on the spacecraft,agency officials said late Tuesday. Discoverywas slatedto launch toward the International Space Station on Feb. 12 to deliver thelast set of U.S.-built solar arrays to the orbiting laboratory. The mission isnow scheduled to blast off no earlier than Feb. 19 at about 4:41 a.m. EST (0941GMT), but an official launch target will be determined at a later date. ?By lookingat it right now, we think it?s about a week delay, but we?re not going to putpressure on the team,? said John Shannon, NASA?s space shuttle program manager,in a briefing at the agency?s Kennedy Space Center in Florida. ?We?ll just letthe information drive us.? The delayis necessary to allow engineers time to be sure that pieces of Discovery?s flowcontrol valves won?t chip off and damage vital plumbing between thespacecraft?s main engines and its 15-story external tank. The valves are usedto keep the space shuttle?s hydrogen propellant tank pressurized as the orbiterrockets spaceward. The valveswere replaced on Discovery after engineers discovered damage to a similar valvethat flew aboard its sister ship Endeavour last November. During Endeavour?sNov. 14 launch, a piece of one of three flow control valves chipped off,apparently from high-cycle fatigue, Shannon said. The valve functions much likea pop-up lawn sprinkler to funnel hydrogen gas from a shuttle's main engineback into its external tank to maintain proper pressure levels, he added. Shannonsaid the damaged valve on Endeavour caused no serious harm during thatshuttle?s November launch and NASA officials want to be sure the same will betrue for Discovery when it flies. ?We don?texpect there to be a problem, but we don?t have the proof in hand,? Shannonsaid. ?We want to have that proof in hand before we commit to go fly.? Shuttleofficials announced Discovery's flight delay late Tuesday after a day-longmeeting to discuss the orbiter's launch readiness. NASAengineers plan to perform a series of tests to evaluate what effects valvedebris could cause during ascent. 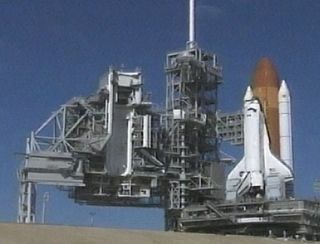 Top shuttle officials are expected to discussthe results from those tests next week before setting an official new launchtarget. MichaelLeinbach, NASA?s launch director, said his team of shuttle workers is currentlyin a holding pattern until a new launch date is set. ?Once we?regiven a launch date, we?ll get back into our processing,? Leinbach said. Commandedby veteran spaceflyer Lee Archambault, Discovery?sSTS-119 mission will launch seven astronauts toward the space station todeliver the outpost?s last set of U.S. solar arrays. Four spacewalks arescheduled during the two-week spaceflight. The mission will also ferry Japaneseastronaut Koichi Wakata to the space station, where he will replace NASAspaceflyer Sandra Magnus as a member of the outpost?s three-person crew. Spacestation mission managers, meanwhile, are tackling several issues to prepare theoutpost for Discovery?s arrival this month and the planned shift to a larger,six-person crew later this year. They range from a recentvibration event associated with a Jan. 14 thruster firing to ongoing, butnot insurmountable, glitches with new life support equipment. NASA spacestation program manager Mike Suffredini said he is confident the glitches willbe resolved and the station ready to support the first six-person crew in lateMay as planned. Suffridinisaid that while the vibrations on Jan. 14, which occurred during a routineRussian thruster firing to boost the space station?s orbit, werestronger than the acceptable limits, they did not cause any structural damage tothe outpost. During the two-minute, 22-second engine burn, the space station?scurrent skipper Michael Fincke of NASA reported that the outpost shook morethan he?d ever seen in his two increments aboard, but he did not hear creaks orgroans from the structure, he added. A videofrom a camera inside the station showed items shaking back and forth. ?You cansee things were moving around pretty good,? Suffredini said. But despitethe shaking, the event did not impact the space station?s 15-year design lifetime,he added. Earliertoday, space station managers in Russia and at NASA?s Mission Control in Houstoncanceled another planned thruster firing planned Wednesday. The next maneuver may take place sometime in March, Suffredini said. Discovery?sSTS-119 mission is NASA?s first of up to six planned shuttle flights for 2009.They include one final flight to overhaulthe Hubble Space Telescope and a series of space station constructionmissions.